Following along from the Mini Fashion Protest post and the Mini Fashion Protest Banner install, I’ve been thinking about clothes and sustainability and the old Make Do and Mend mentality, where people during the war would fix their clothes instead of buying new ones. The Make Do and Mend movement is having resurgence at the moment, it’s heartwarming that all over the world people are choosing to prolong the life of their clothes rather than jsut toss them out to buy new ones. Which brings me to yesterday. I was at home, having a day off and decided to tackle the mending pile. I patched two small holes in two pairs of jeans then I came to my favourite pair, which have been out of rotation since I noticed a new hole a few weeks ago. Usually I buy my clothes at op shops, but about 4 years ago I was about to start a new job and I needed a nice pair of jeans to wear to work. Shopping in op shops is a long ongoing project which can take you a number of trips to find what you need. But I didn’t have that time, I needed new, nice, non torn jeans asap. So I walked into a retailer, feeling a little guilty, and walked out with a new pair of jeans. I’ve worn them every week since I bought them, and about a year ago I noticed they were getting holes in the inner thighs. So I went to my sister and asked her how the best way to patch jeans properly. She taught me the method she uses, which was taught to her by our grandmother, and I used this knowledge to patch my jeans. It was kinda lovely, patching my jeans the same way my sister does, which is the same way my mum does and my grandmother did. It involves firstly sewing a patch of strong material (my sister uses denim, I had some tough brown cotton from an old pair of pants) to the inside of the pants over the hole. The photo below is after the second step, but the stitching around the edge of the patch is the first step I’m talking about. Then you turn them over and zig zag across the hole a lot. 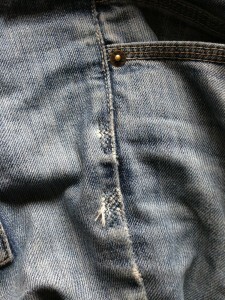 This strengthens it by attaching the holey/frayed/worn piece to the tougher material behind it. It’s not very noticeable and pretty much disappears when you’re wearing them, if you’re worried about that. In the photo below, the patch at the top is the old one, the bit at the bottom was the new patch from yesterday. While I was sewing these patches on, it occurred to me that not only is it economical and environmentally friendly to patch your clothes, but it honours the work of the person who originally sewed them. I can sew but sometimes my seams are a little wonky, or the thread isn’t quite the right colour or I get little ripples in the fabric. Looking at the quality of the sewing in my jeans is a little awe-inspiring. I will never know who sewed them, but they did an amazing job, and I couldn’t sew pants this well without a hell of a lot of practice (which I guess they’d had, cue guilty pang again). So patching them means that I am taking on the project of looking after and prolonging the life of these pants that someone with quite some skill originally made. It also means that I’ll get to continue to wear my super comfy, great fitting jeans. Holding them up to the light, after finishing patching the inner thighs, I then found a little hole on the side, which I sewed up too. Holding them up to the light showed me just how thin they are in places, which means that they’re going to get more holes in them soon. But I decided then and there that these would be the Jeans That Never End. 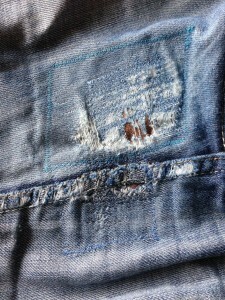 I challenged myself that I would keep patching these jeans as long as humanly possible. Eventually they’ll be more patches than original jeans, but that’s ok too. 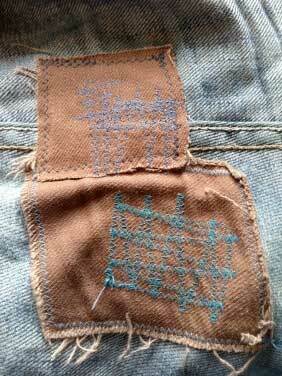 The patches will tell their story and each time I see them, I’ll be reminded of the landfill they’re not occupying and the fact that generations, not just of my family but of families the world over, have mended and patched their clothes in this way. The Jeans That Never End, for me, will be a symbol of the clothes of all ages which have ever been patched and the people throughout history who have carefully mended what they own rather than throw them out and buy a new set. And I know that’s a lot of history for one pair of jeans to stand in for, but they are being strengthened every time I mend them, so I’m pretty sure they’ll have the resilience to carry it proudly. Riding on the high of fixing three pairs of jeans, and instating The Jeans That Never End, a new long term personal project, fired me up for mending. So I also hand sewed patches on three coats (my machine was playing up by this time) and sewed buttons on a vintage dress I purchased about a year ago, sans buttons, and it’s been in the mending pile since. I even bought new buttons for it, the day I bought it, but haven’t gotten around to sewing one to the other until now. Yesterday I was a mending queen! I finished up by crocheting a few squares from scrap wool for the Post A Patch project, who collect granny squares from people to sew into blankets for various charities. Because personal activism is important, but so is helping out others in need. Fantastic Sayra! I love the idea and all the meaning behind it. It struck me that it is also symbolic of the general nature of the ready made, must have it now, disposable nature of our present. Long may The Jeans That Never End last! Thanks Steve! In fact you might recognise the jeans, I bought them for the job where we met! I’m actually really rather keen on this project, it’ll be an interesting long term one and I can’t wait til I have to patch more visible places. I’ll be wearing them with pride! Next post: Introducing the new NEWSLETTER!